It is 1948, and England is recovering from a war. But at 21 Nevern Street, London, the conflict has only just begun. Queenie Bligh's neighbours do not approve when she agrees to take in Jamaican lodgers, but Queenie doesn't know when her husband will return, or if he will come back at all. What else can she do? Gilbert Joseph was one of the several thousand Jamaican men who joined the RAF to fight against Hitler. Returning to England as a civilian he finds himself treated very differently. It's desperation that makes him remember a wartime friendship with Queenie and knock at her door. Gilbert's wife Hortense, too, had longed to leave Jamaica and start a better life in England. But when she joins him she is shocked to find London shabby, decrepit, and far from the golden city of her dreams. Even Gilbert is not the man she thought he was. I’ve had this on my bookshelf for ages- apparently my mum has tried to get me to read it loads of times but I’ve resisted for no particular reason or just been easily distracted by other books landing on my to-read shelf- but I’m so pleased I finally got around to reading it. Strange that I read it around the same time as The Help by Kathryn Stockett as it’s set at about the same period (or a little earlier) and explores Jamaican immigrants to England who served during the war for their mother country. I feel like I was given another image for the people who could have landed in the U.S. and become the servants in the south but instead took their own path to England and tried to forge themselves a life in a country they believed should welcome them as compatriots. It was particularly interesting to see the treatment of the Jamaican soldiers in the UK by the English versus the American soldiers stationed in the UK. As I read the novel I felt like their welcome was better at the beginning of the war and as time progressed the prejudice seeped in to the English culture also. The characters in this novel tell their own stories and it travels between four voices seamlessly telling their own backgrounds and how they came to be where they were in the present. Their stories were sometimes gut wrenchingly honest and Levy is an amazing writer who creates clear worlds with very little description- there were even smells and sounds coming off the pages for me at times. 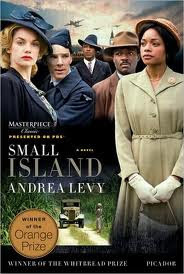 The novel doesn’t tell an entirely happy tale but most of the characters have an inexplicable joy despite the circumstances they find themselves in and I definitely loved Small Island. I now have to tell my mother she was right.